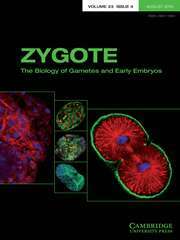 Zygote is an international journal dedicated to the rapid publication of original research in early embryology. It covers interdisciplinary studies in animals and humans, from gametogenesis through fertilization to gastrulation. The scope includes gametogenesis, sperm-oocyte interaction, gamete and embryo physiology, cell polarity, cell-cell interactions, nuclear transfer, haploidization, molecular genetics, developmental genetics, in-vitro fertilization, and stem-cell and cryoconservation technologies. The editors favour work describing fundamental processes in the cellular and molecular mechanisms of animal development, and, in particular, the identification of unifying principles in biology. New technologies, clinical papers, review articles, debates and letters are prominent features.